An ABC Open story about the community process of making the Warrgamay books, by Producer Michael Bromage. Warrgamay language books are made to give physical value to the Warrgamay language. 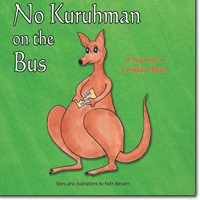 To help children, families and schools learn the language Bridget and Melinda produced two books. With the help of Faith Baisden, the two Warrgamay sisters produced My Mala Love to Clap and No Manjara on the Bus. Throughout the last decade the Warrgamay people have worked hard to reclaim their traditional language. Today we are developing story books for children using the Warrgamaygan mayay. We are currently working on two children’s story books written in both English and Warrgamay. 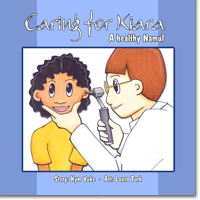 These story books will have the facility of an audio recording along with the book. ABC Broken Hill, article by Margaret Paul. It’s hoped new books being launched today will help Aboriginal children from far-west New South Wales learn their traditional language. 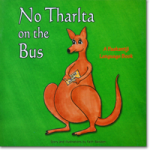 An Indigenous Literacy Foundation press release for the launch of No Tharlta on the Bus and Lenny & the Big Red Malka in the Darling River region of north western NSW. In the last week of July, a small Indigenous Literacy Foundation staff, along with thier Program Evaluators, took to the Barrier Highway to launch Binabar’s new books in north west NSW. The program visit was over three days and involved media interviews with the Barrier Daily Truth and Broken Hill ABC Radio, visits to potential partners and most importantly, the delivery of workshops in Menindee and Wilcannia with kids aged 5-10 years old. Working with local elders and literacy educators, Murray Peters and Kaylene Kirwin, locals and guests began to master some Paakantji language. The kids loved the stories, music and songs that were written by Binabar Books to introduce new words. On this trip we delivered over 150 book packs and additional sets of books. Read the full story on the Indigenous Literacy Foundations website. 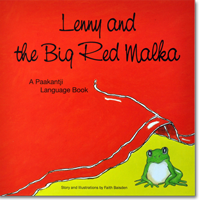 Three titles have now been produced in the Binabar Books range – in four different Aboriginal languages. 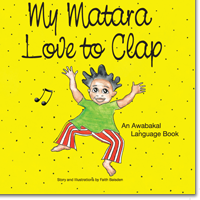 Each of the titles can be adapted for other languages, and Binabar Books will assist you with the appropriate way to collaborate with your local community to incorporate a new language. We are also happy to write and illustrate new stories to deliver your message. An added feature of the books is the inclusion of sound within the pages so that readers can hear the correct pronunciations for new words. The sound is picked up through an Audio Reader, which is sold separately. One Audio Reader can carry up to 100 different books and the sound files for new titles will be available on the Binabar website. However, the use of the sound feature is not essential to a full appreciation of these story books. 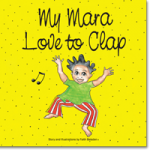 Indigenous Literacy Foundation press release for the launch of My Mara Love to Clap in Wilcannia, April 2011.